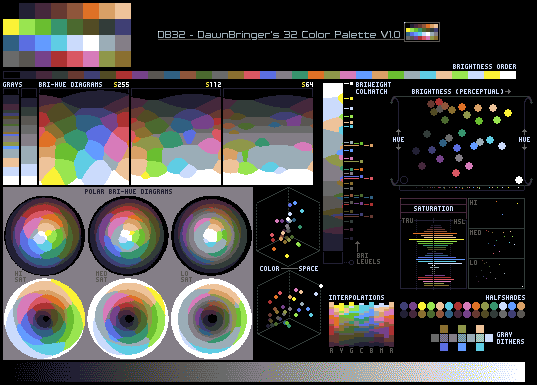 As somewhat of a follow-up to the DB16 Palette, I here present a 32 color big-brother; the DB32. Again, this is a palette that tries to be as multi-purpose as possible, but with a clear slant towards archetypical game graphics & pixelart. I have been working on a 32c pal since the DB16, but 32 colors is far more complex than 16 when you try to make all things work optimally together. Then when Hapiel of PJ accidentally asked if I could help out with a 32 color palette for the Open Pixel Platformer Project, it was a good incentive to wrap this one up. For this reason, the presentation is a little basic right now - but over time, I hope to expand this page with more info, drawings, ramp & dither charts etc. But feel free to ask any questions. I look forward to trying this out for painting; I wanted to use the 16col version but it was too limited. This has a nice range of hues with an overall watercolor or cartoon feel. Re: "Tru": I notice you never use LAB or LCH colorspaces in the DB-Toolbox code. Is this because you've tried it and found it unsuitable, it's too hard to implement correctly, too slow, it only roundtrips 99.5% of sRGB colors intact, or what? I ask because LCH definitely has a more 'true' measurement of saturation than HSL (either standard or 'correct linear' HSL), and LCH/LAB are the colorspaces used by several standard 'color difference' measuring algorithms that seem to perform well. "Here's a GPL version of this palette"
Here, have a cross dither chart. The world is but a shadow of emotion, cast in shades of grey. I'll love to use it in future pieces. I liked your 16 color palette a lot, required some skill to use it yet it made the pixelling task funnier (and the general style of the pieces is pretty nice). At first glance this palette seems to wide the limits of the 16 color palette (there is more variety in saturation which allows a better contrast as can be seen in the Monroe piece, and the fact it supports magentas is awesome!). I haven't understood the 'Tru' value though :o. Don't forget to explore the two "dirty yellows" (last in palette) they are wonderful in their versatility, f.ex one of them could replace the gray on the tree's trunk. Your 16 and now 32 color palettes have been so inspirational and motivational. These have quickly become pixelart classics. Many are more comfortable and color savvy that they ever would have been without them. We simply don't know how to properly thank you other than by using and exploring them. We hold on to SilverStar Badges and save them for special occasions only and this truly is deserving. Its in your profile. Gratz! You certainly deserve it :). I've learnt a lot with your colors (and still learning!). save the picture of the palette and open it in GG. Open this tab : All frames -> Color Depth, then select the 8bpp option. You'll notice your palette window changed to all 32 colors (more if you added new colors). In the same palette window click the small arrow icon and click "save palette". Just name the file DB32 or anything you like. Now you just have to load that palette for your future works. EDIT : Noticed there's the pal file in the first post. You can just download that and load it. I'm fairly new to the concept of actively using pallettes. How do you guys use them? Do you mean 'how do we get the palettes into the software we use'? If you just mean 'how do we utilize them' in an artistic sense, there's really not much to it -- we just don't use colors that aren't in the palette; sometimes this forces us to make different choices in color scheming, that are often better than we would otherwise make. Similarly when choosing lighter/darker shades of a base color, or blending between colors, we often have to think creatively about what existing palette color to use, rather than simply making a few new colors exactly dedicated to it. This tends to give the picture an attractive sense of consistency. 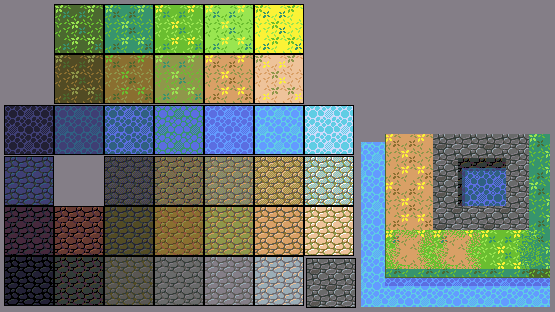 I almost want to make an entire game's worth of graphics with this palette. Could I, if I decided to? I've been using DB32 as a basis for a bunch of non pixel-art doodles ad I think it works quite nicely with blending too. Posting my little work with DB32 here. DawnBringer, thanks for good instrument!!! Apparently not. I can linkify the above items, but when I preview the post, they are not linkified. sh*ttle2 is probably wrong though -- the filename probably got changed during upload, since it has a bad character. Mrmo this palette suits you brilliantly. How 'bout an .aco (Photoshop Swatches)? Are these meant to be the only 32 colors you use or are these basically "base" colors that you can create more from while having them still look good together? If the latter, which RGB and/or HSV sliders can I change and still make these colors look good with each other? Sorry if these questions are silly. I'm new to pixel art/color palettes. Generally speaking, pixel artists try to keep color counts low with smart mixing of colors, and a limited color palette encourages creative uses of colors. In that sense, DB’s palette limits your color choices to spur your creativity. DB’s palette can also serve as a “base” palette, yes. I don’t think even he would say otherwise. But try working with the limited color selection first; it’ll likely help you understand how colors work together in pixel art (an important bit of knowledge you’ll need going forward). 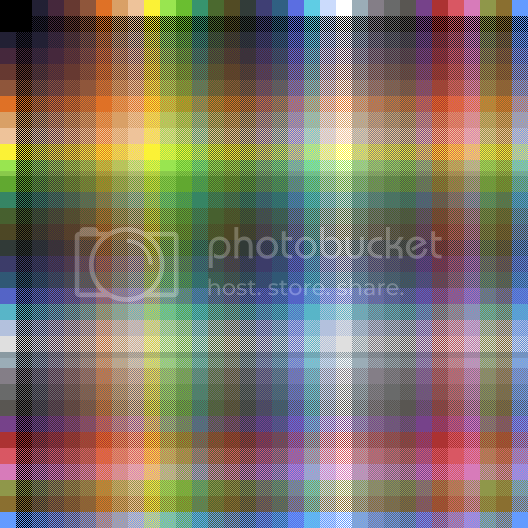 After you have started using this color in your image, tweak the HSV numbers and use your own eyes to determine what is the best lightness, hue/value, saturation. The above process creates linear ramps/gradients, especially if you repeat it several times between two original colors. The range in itself will look OK, but note that it will not be as "rich" as if you had nudged the colors towards different hues and saturations. If the original palette is brilliant and rich, and you still use a lot of it, your image will still use most of the palette's potential. But if you use a lot of your intermediate colors, you may want to spend some time tweaking the entire ranges, to bring some variety. Interesting. I probably would have never thought to do this. Thanks. Question, though: is the idea that I should try sticking to ONLY this palette's 32 colors if possible and only use the above formula if absolutely necessary? Because, one thing I noticed is there's really only one yellow color. For example, I tried copying someone's thunderbolt game icon for practice and I had trouble doing so because they used a light yellow for light which faded into all kinds of golds, etc.. Would that be an example of when I should use the formula to create some golds? P.S. - Is there a simpler way to find these averages than to manually use a calculator? There's litte point in using a preset palette unless you're gonna stick with it. DB32 is quite evenly distributed over most of the (frequently used) spectrum/colorspace. While there are gaps that could be filled without distrupting the harmony too much, you're more likely to create a mess. Adding to a preset palette will teach you close to nothing (as a beginner). Instead, as StoneStephenT pointed out, learn to think dynamically & creatively about the colors that are available. Do you really need a specific color, maybe a slightly different hue could also do the job? If availabe colors aren't quite matching your needs, think about shifting the hue or brightness-level of your scene instead. Learn to mix it up with different colors to create the perception of another hue. However one can use a preset palette as a quick & solid starting point; only using a selection of colors, then adding your own and possibly tweaking the original colors to conform with your vision. But just adding more & more colors to the original palette is not recommended unless you know exactly what you're doing. Also realize that the bigger the palette is, the harder it is to tweak it and still maintain coherency. And in this context 32 colors is pretty damn big. If you draw at 50% opacity/transparency with color1 over color2, it will produce an average of the two. Depending on your program, it can be the RGB average, or a better rule. In any case, you can start from there, and adjust manually. Do you really need a specific color, maybe a slightly different hue could also do the job? That's why I asked if I could change HSV sliders while still keep the colors "matched" together. So, you're saying I could indeed change these sliders if I needed a slightly different color than the ones available? I just wanna know exactly how far I can push these colors - or, are they literally meant to be the ONLY 32 colors you should use and you should NOT change any HSV sliders, if possible. Also, if I were to come across a game's(or whatever) art that I love in terms of color, could I just use the color picker to take its colors from screenshots and sorta create my own palette that way, or is this not a good way to create palettes? I meant picking a different color from the palette. It's about working with what you got. Making minor tweaks to an established palette is just bad form and confusing to the public. Either use it intact or as a starting point to make something completely new. You'll never make a good palette if you don't practice how to use limited colors in the first place. There is no one “ideal” way to create a palette. What matters is creating a palette that lets you portray your work as close to your idea as possible while keeping the color count low. Take a look at my current avatar (a sprite of Gadget Hackwrench from Rescue Rangers). Not counting transparency, that piece uses 13 colors to express the “idea” of Gadget in a standing pose with her hands behind her back. I could’ve probably used two or three additional colors for shading/AA purposes, but 13 was enough to get the “idea” across to the best of my abilities. With a few “tricks”/techniques I’ve picked up in the year since I posted that sprite, I did my best to improve it—and I switched to using the DB32 palette due to reading this thread right before I set to work on the last few edits. I reduced the color count by three (again, not including transparency) and went for a less “outlined” look, but I didn’t have to alter much about the sprite to achieve what I feel is a slightly improved attempt at expressing the “idea” of that standing pose. Quoting author Chuck Wendig: “The idea is God: perfect, divine, incapable of repudiation, utterly untouchable. The result is Man: fumbling, foolish, a jester’s mockery, a bundle of mistakes in tacky pants.” You’ll never achieve a perfect representation of the idea in your head, regardless of the medium you use to express it. The best you can do is an imperfect representation—but you can make it slightly less imperfect if you know what you’re doing. In pixel art terms, that means knowing how to use a small(-ish) amount of colors in the right ways. A good number of artists around here will tell you that you’ll want to use only as many colors as are necessary to express your idea. You can create a piece that uses 20 colors, but if you can whittle that count down to 15 via color balancing and achieve similar/better results, your work (and your skills) will likely be all the better for it. While I wouldn't suggest straight-up copying another game’s palette (unless your work calls for doing that), studying how those games used colors might lend you some insight into how you can better use colors in your own works. Same goes for pixel art pieces around here. Thanks for the replies, guys. =) Think I should start with the DB16 and practice. That's why I asked if I could change HSV sliders while still keep the colors "matched" together. Something that hasn't explicitly been discussed on this thread is transparency. Using transparency, especially on the outside of a sprite or when two sprites (or colors) come together will help blend your world and strictly speaking make more colors. Again, try limiting yourself to only using certain transparency values (like 50% only, or 20%/40%/60%/80% only). I tried copying someone's thunderbolt game icon for practice and I had trouble doing so because they used a light yellow for light which faded into all kinds of golds, etc.. So yes, either use transparency or (better yet), depart from the original image's pallette and use this one to its fullest. There are plenty of orange, peaches, greys, browns, and reds that I imagine you can approximate the lightning bolt just fine - it will just necessarily look different (which, remember, is the point).